September 18, 2014, Philadelphia, PA- Eda’s Sugarfree is pleased to announce its new premium 3.5 oz. stand up pouch package available in over 21 flavors. This smaller package allows retailers to hit target price points for maximum turn while new premium design and materials reflects the premium flavor of Eda’s product creating brand authenticity in the mind of the consumer. Eda’s will be phasing out its current 6 ounce package in favor of this new offering. 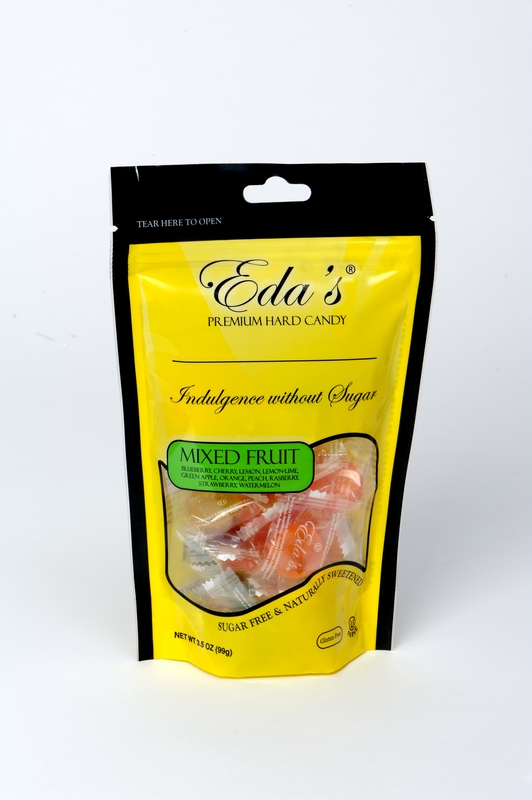 Eda’s Sugarfree is naturally sweetened, gluten free, kosher parve, and has been made in the USA from scratch since 1958. Mike Bernert, Eda’s VP of Marketing Mike Bernert said, “Eda’s finally has best in category packaging to match its best in category taste. Sugar free is often overlooked as part of the confection set, but our experience for three generations proves that a quality sugar free offering, will attract repeat destination shoppers and differentiate retailers. This entry was posted in Company News and tagged 3.5 ounce bag, new bag, new pack, sugar free candy. Bookmark the permalink.